Bastar Inspector General of Police SRP Kalluri said on Sunday that JNU student Umar Khalid could be part of a plot involving AAP legislator Soni Sori who had been smeared with a chemical substance on 20 February, reports The Indian Express. In a press release on Sunday, Kalluri said: "Umar Khalid, who shouted anti-India slogans and pro-Pakistan slogans in JNU Delhi, who is in jail on charges of sedition, mentioned the attack on Soni Sori and the (Jagdalpur) Legal Aid Group. CPI (Maoist) spokesperson Vikalp in his press note on February 21, has also mentioned the smearing of 'khallikh (black ink)' on Soni Sori and the attack on (journalists) Malini Subramainam and Alok Putul, which shows that the Soni Sori incident has been conducted because of a conspiracy, and it is essential to expose the case. The investigation is being conducted scientifically and soon, the criminal conspiracy will be unearthed. " JNU student Umar Khalid had spoken about Sori and the Jagdalpur Legal Aid Group in a speech on the night he returned to the JNU campus. He surrendered to the police later. Kalluri's press release also stated: "It is the intention of the IG, Bastar Range, that the truth of the incident be revealed as soon as possible, so that the anti-Naxal programme can be continued apace. For the investigation of the incident, Kalyana Elsela, ASP Bijapur, is in Delhi. The main eyewitness and witness in the case [Soni Suri] is adopting a non-coperative stance, but many facts have been revealed. With some more evidence, the police will soon reach a conclusion, and incident will be exposed, so that anti-Naxal operations can continue." In a report to the IG, Elsela had said: "The team met the doctor who is treating Ms Sori and it was found that she was never in a critical state as reported in the media. She is under treatment to prevent any infection on her face and does not require any plastic surgery. She was admitted with irritation caused due to some unknown substance. The traces of the substance (were) sent for forensic analysis by police earlier. 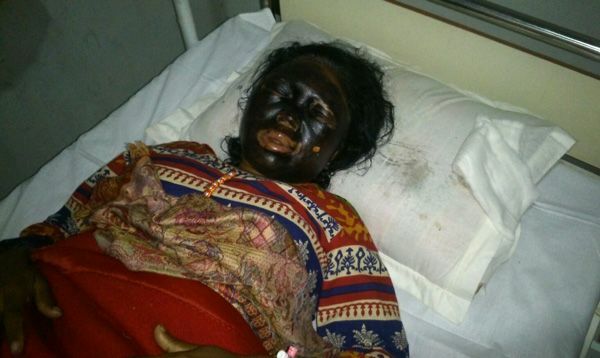 It was unusual that after the substance was wiped off the face at Gidam and Jagdalpur, she appeared with dark black substance on her face when she reached Delhi. However the doctor advised that a final opinion can be given only on completion of treatment." The Bastar Police are facing allegations that they are pressuring activists who work on tribal concerns. The Jagdalpur Legal Aid Group and Scroll.in's Malini Subramaniam have left Bastar over the past 10 days. BBC journalist Alok Putul wrote that he was told by Kalluri and Bastar SP RN Das that the police only "work with patriotic journalists". The convenor of the Chhatisgarh Aam Aadmi Party, Sanket Thakur, said: "It is clear what the Bastar police is doing. By alleging a conspiracy, they are manufacturing a new conspiracy. Additionally, I am surprised that a police officer of the rank of IG can connect something said in JNU to this case. What is the connection?"